If you’ve got a nagging headache or any jaw-related pain, you’re likely suffering from TMJ Dysfunction. Your symptoms might include headaches, soreness, jaw clicking, and could potentially cause other health problems if left untreated. Our treatments will help alleviate the disruptive pain and discomfort caused by TMJ. If you’re feeling any of these symptoms, we recommend you come in and see one of our dentists as soon as possible. “TMJ” stands for temporomandibular joint. 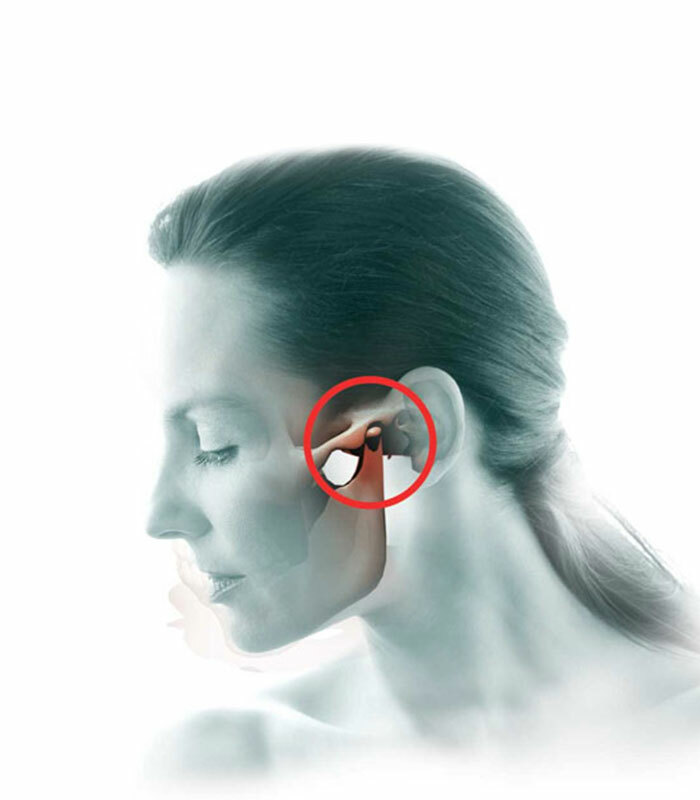 Your temporomandibular joint is the hinge joint that connects the lower jaw to the temporal bone of the skull. This is the bone in front of the ear on each side of your head. These joints are traditionally flexible, letting the jaw move smoothly up and down and side to side, allowing you to talk, chew, and yawn. When you have TMJ Dysfunction, your jaw joint and surrounding facial muscles aren’t moving as smoothly as they should, because of problems with the muscles of the jaw, or the joint itself. Other common symptoms of TMJ include toothaches, neck aches, dizziness, earaches, hearing problems, upper shoulder pain, and ringing in the ears. Because of excess tension and dysfunction in jaw muscles, patients have been known to experience lockjaw, clicking and popping jaws as well as swelling on the sides of the face. Our experienced dentists will assess your mouth and jaw to determine the best solution for you. Injury to the jaw: Trauma to the temporomandibular joint or muscles of the head and neck such as experiencing a heavy blow or whiplash have been known to develop TMD. Bruxism: Grinding or clenching the teeth puts a lot of pressure on the TMJ. This often happens at night, when you’re completely unaware. Dislocation: The soft cushion or disc between the ball and socket of the jaw might have moved or dislocated. Stress: We often tighten our facial and jaw muscles or clench the teeth when we’re nervous or stressed. How can Duncraig Dental Care help? After a full mouth assessment and consolation, we can help treat your TMJ. In this session, we will discuss your symptoms to diagnose the seriousness of your case, and decide on the appropriate treatment. Sometimes surgery may be recommended, but in less extreme cases, we have less invasive procedures that might be suitable for you.